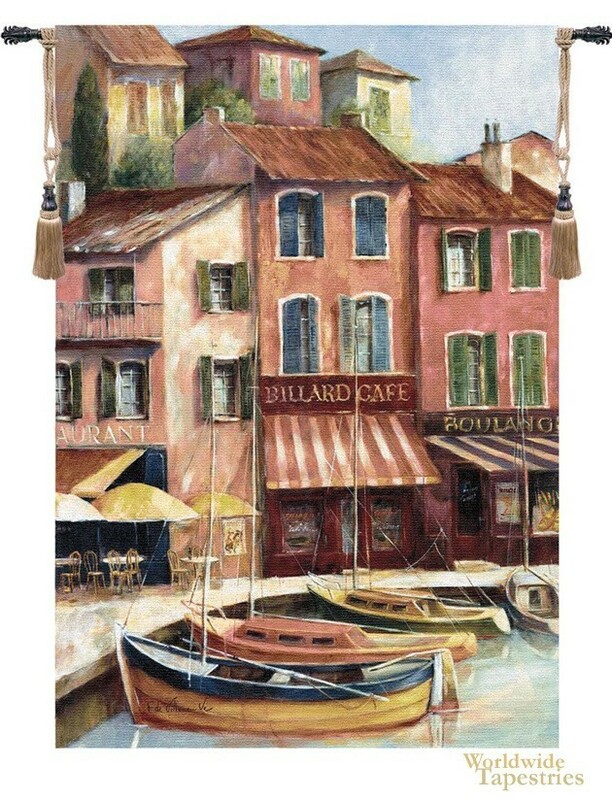 This tapestry "Billard Cafe" shows a seaside cafe on the beautiful Mediterranean coast. Full of vibrant color and wonderful use of light, this piece by Fabrice de Villeneuve bears his hallmark signatures. Here we see the boats moored and the quaint buildings in this part of Europe in its gorgeous red color palette. Life on the Mediterranean is characterised by the beautiful landscapes, life by the sea and the charm of the buildings and cafes which make up the villages on the coastline as seen here in this vibrant tapestry. This seascape tapestry "Billard Cafe" is backed with a lining and has a tunnel for easy hanging. Note: tapestry rod and tassels, where pictured, are purchased separately.